We look forward to helping your team with its Domestic or International B2B collections needs. If your business works in traditional or new media, tech SAAS, financial, insurance, telecom, or any other B2B sectors, consider partnering with WCS. We will help you collect on your problematic account at every stage of the collections cycle, regardless of where your problem customers are. Managing a successful business or credit department that can meet all of its bills on time is challenging, which is why WCS LTD is now offering an innovative pre-collections service. If you're a current client of WCS, we would like the chance to wish you a happy birthday! The staff at Williams, Charles & Scott LTD. can be reached from 9 AM to 5 PM Monday through Friday Eastern Standard Time. While we may be diligent in our collection efforts, the staff also focuses itself on being responsive to inquiries, suggestions, and requests whenever they arise. Feel free to contact us for any reason regarding your past, present, or future collection needs. What Can WCS LTD. Do For You? 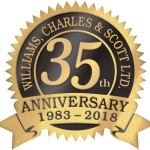 Established in 1983, Williams, Charles & Scott LTD. – (WCS) is a global leader in both the Domestic and International Commercial Collections Industry, providing prompt, personal, and effective service. With a diversified clientele on both the Domestic and International level, we have established a track record of excellence in handling all types of Commercial accounts. We are also longstanding members of the American Collectors Association (ACA) and since 1987, are holders of the Certificate of Compliance from the agency section of the Commercial Law League of America. We fully realize that debt collections is a people business. There are no computers attempting to do the job in lieu of our collection staff. Our goal is, however, to make use of the best in modern office and automated equipment to keep efficiencies and effectiveness of our communication with our debtors to a maximum while keeping clerical overhead to a minimum. This enables the staff at WCS to devote more time to our clients and their accounts, reports, and their unique needs. We understand our roles in that we are problem solvers. Most of our debtor organizations find themselves in situations that they didn’t expect to be in. Through strategic demand letter employment and skilled negotiation tactics we are able to create the traction on delinquent accounts that other agencies can’t. WCS utilizes a Nationwide Network of attorneys who specialize in creditor representation, thus enabling us to select the right law firm to successfully handle client accounts. Our data files on these attorneys enable us to select the right law firm to handle the particular case successfully. On significant accounts, where legal intervention is likely, we will request authorization to run additional pay-per-use reports. This service is designated for claims greater than $25,000, we offer special low rates. It is an effective service designated for claims requiring special handling by Senior Management. On all substantial problem cases, if the full amount cannot be extracted immediately, we will advise you of the proposed work out arrangement for your acceptance. Attempts will always be made to secure work-outs with written guarantees, both corporate and personal. Our years of experience in the collection industry with high dollar situations insure you of maximum cash recovery and regenerated profits for your company. Please contact the executive staff at sales@wcscollects.com to speak about your major claim matter or to request an endorsement of success from a number of our clients. This is our specialty. From the Caribbean to Australia, throughout Europe and Asia, we have amicably and expeditiously collected a vast majority of the claims in these areas. We have established close ties with private investigators, international attorneys, consulates, and other global business contacts that are knowledgeable in commercial collections and are available to handle even the most difficult cases when our efforts have been unsuccessful. With the wherewithal and knowledge attained from years and years of experience, we have the ability to collect in almost every country, convert almost any currency into U.S. Dollars, clear your international checks, and reconcile your international banking problems. This service is especially designed for high volume, low dollar delinquencies. WCS has an effective ‘dunning’ service which will turn small receivables back into cash quickly. WCS is able to create a customized letter series either for smaller balance account batches or on a pre-collection basis at a nominal cost. With the utilization of the latest in software and web based technology, WCS uses skip tracing to identify, locate, and contact debtors with efficiency and effectiveness. Believe it or not, companies actually conceal their business identity to avoid payment in case they run into financial troubles. WCS can locate your debtor through what we call Reverse Search Triangulation. This allows us to locate the debtor in innovative and industry leading, non-standard ways. Which lets WCS to catch the debtor ‘off guard’ and make immediate inroads in recovering your debt. As a normal course of business, WCS will go beyond the debtor’s facade and skip trace at no extra charge on all accounts placed. Clients are able to send placements from an existing system to ours via our web portal or via various forms of media with minimal lag time at no additional cost to our clients. Please email sales@wcscollects.com to discuss this time and money saving service. The success of our international recovery efforts are due to our ability to respond to our clients’ needs. Additionally, we utilize fully translated demand letters to recover your funds from Spanish speaking debtors when needed. WCS uses the latest in technology solutions to create payment opportunities which accelerate liquidation of your debtor account. These technology solutions allow the staff at WCS to recover your debts via “checks by phone,” one time payments, via overnight courier, wire transfer, as well as automatic withdrawals for weekly, bi-weekly, monthly, or quarterly payments. The following is a growing list of additional payment tools that WCS employs for every client. Pay your account from anywhere, at your convenience. It's safe and secure, your information is protected. You can easily place delinquent accounts via our online form ensuring prompt attention from our staff. Existing clients can securely log in to obtain account status and reports 24/7. With the help of WCS LTD’s Early Stage Collect (WESC) Program, your team can begin pre-collections procedures on all of your debtors right now. Our staff welcomes inquiries, suggestions, and requests whenever they arise. Feel free to contact us for any reason regarding your collection needs. An ever expanding set of links, valuable tools and resources, for credit professionals. Each year Williams, Charles & Scott LTD. receives thousands of claims from almost every state and from abroad. We hold long standing business relationships with clients across the United States, as well as representing major international firms. At WCS we must not only be familiar with the peculiarities of the laws and recovery procedures of the 50 states, but we must be aware of what must be done in order to collect quickly and voluntarily. Additionally, our recovery services are supported by full legal involvement for any of your accounts where litigation is deemed the most appropriate course of action. Furthermore, we are both bonded and insured and maintain a trust account for all recovered funds. Our collection procedures are not based upon guesswork. They are predicated upon debtor research, hard facts, and a wealth of foresight and knowledge that has been acquired through years of hands on experience. Additionally, doing business in the 21st century requires us to be specialists in using the latest computer and web based technologies to search, locate, contact, and recover on your account from your principal debtor before competing creditors do. Our staff are professionals who know the importance of cash flow, cash recovery and regenerated profits and are seasoned recovery specialists. Thousands of dollars are spent investing in the continuing education of our team to maintain the high performance standards we know you require. Our staff is therefore always ready with the skills to serve you. You can reach WCS at any time via our contact form.